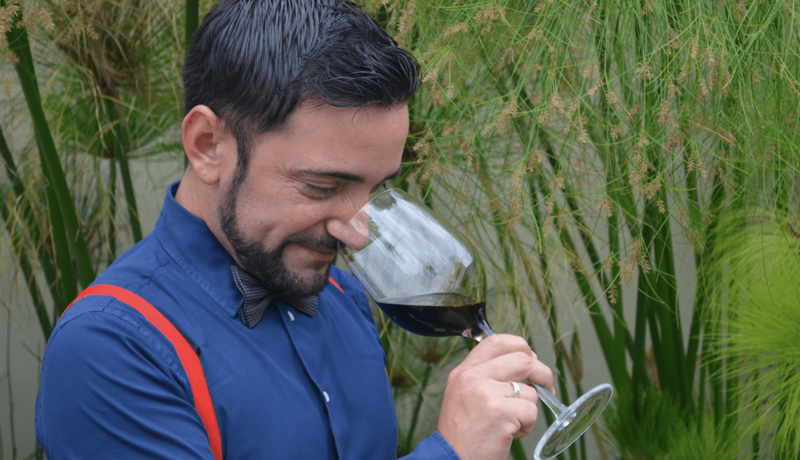 Buenos Aires’ bow tie and braces-wearing host with the most, sommelier Pablo Colina is a cigar aficionado who not only teaches but covers all corners of the trade, working for Coyanco distributor, in service and curating menus. You can currently tap into his wisdom at Söder Buenos Aires. When I propose a pairing, I like to listen to the client, ask what they like, which varietal, that wine style, and then propose a match with the dish they have chosen. It also depends on the style of cuisine or whether it’s a tasting menu, bearing every ingredient in mind as well as the cooking style – that’s why communicating with the chef is fundamental. I like to be bold when harmonising and play with unexpected pairings. The last one: an eight-day cured rib-eye, red cabbage pickles with flowers, cured yolk and crunchy rice with Punto Final Sauvignon Blanc by Bodegas Renacer from Casablanca Valley, Chile. The chosen wine was Tiara de Viña Alicia, a great white, balanced and elegant created by Rodrigo Arizú. It’s an unforgettable blend made from Riesling, Albariño and Savagnin grown in Lunlunta, the only such blend in Argentina. Chablis, where they make unforgettable Chardonnays. Thanks to the geographical variety, you can get different styles with protruding mineral notes and a unique complexity in whites teamed up with exquisite acidity. This is the cradle of this ruling white varietal, a zone where diversity of style reigns, depending on the producer. Another region I’d like to highlight is Champagne for its wide diversity in accordance with its classifications. My love for gastronomy and wine were transmitted to me by my family from a young age. After my studies, I started working as a waiter and in other positions at a restaurant until I qualified as a sommelier; then I turned the salon upside down and my love for wine started to deepen, for wine and everything related to it. I enjoy every moment because every moment in gastronomy is unique, from recommending a wine and dealing with a customer to trying new things to assembling a menu, listening to enologists every day to learn how to communicate, from the respect and humility of such a noble product that has so much work behind it. I’m not really into keeping wine so I love to drink what I have in my collection, but I do have a few untouchable gems. One is the Enzo Bianchi Grand Cru 2001, an Argentine classic by Bodega Familia Bianchi, from San Rafael in Mendoza. A lot of wonderful things have happened to me during my career but one of the best was dining at Château Lafite Rothschild last year. That’s a winery with such a marked history and to be in their cellar, drinking that wine in their garden watching the night draw in in Bordeaux is something I’ll never forget. Hahaha. Hmmm, that’s hard. I think I’d be a young Champagne, scintilltaing, acidic, elegant but also fresh, wanting to maintain a little amusement. Between laughter, a lot of laughter… knowing it will age well. Tags:Coyanco distribuidor, sommelier Argentina, sommelier Buenos Aires, Sommelier Pablo Colinas, Tiara de Vina Alicia, What was your last pairing recommendation?